Aboard the ship where numerous radicals, both Caldari and Gallenteans, demonstrating against recently exposed information about dubious drug experiments the Corporation was undertaking, involving for instance slaves provided by the Amarrians. But the Fiend is not only cunning, but also paranoid. He never stays long in any one place and even his closest associates are often in the dark about his whereabouts or future plans. This extreme paranoia has served the Fiend well in his on-going crusade against the pharmaceutical industry and other “totalitarian institutes with no regard for human life” as he himself phrases it. Even if he’s a hunted man the Fiend still finds time to plan and execute his terrorist acts that have made him famous. 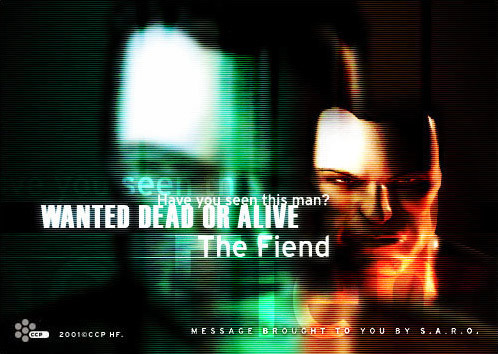 The Fiend is indiscriminating in the selection of his targets, a clear sign that he holds few customs or creeds dear, something that his criticizers have pointed out as a serious contradiction – on one hand he claims to be fighting against those that hold human life in contempt, while on the other he frequently kills innocent bystanders in his attacks.